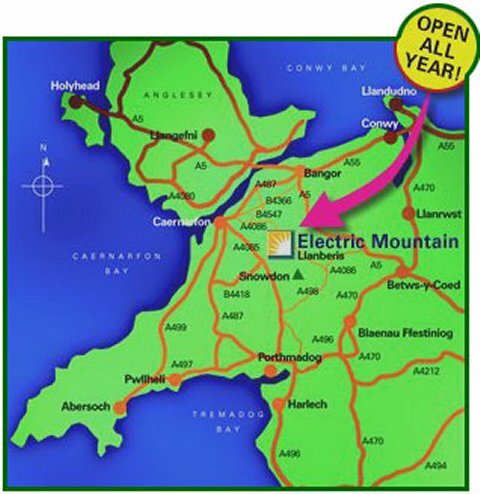 Amid the Welsh Mountains, serene lakes and dramatic landscapes – at the edge of the picturesque Snowdonia Park you will find the Electric Mountain Visitors’ Centre. Once you enter the Visitors’ Centre you will be in a different world. 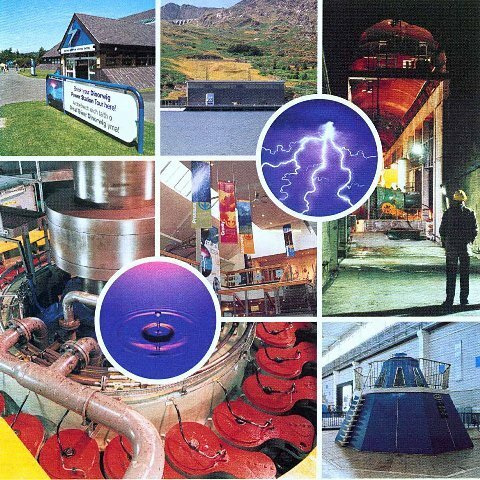 You will then be introduced to an Underground tour deep into Eliden Mountain, where you will be able to see, feel and hear Europe’s largest man made cavern in operation with some of the largest and most powerful hydro -generators in the world. A bus will take you from Electric Mountain into the centre of the Dinorwig Power Station. You will pass through many tunnels – stopping every so often to get off the bus and see the magnificent generators close up. And learn how they can go from zero output to full power within seconds. 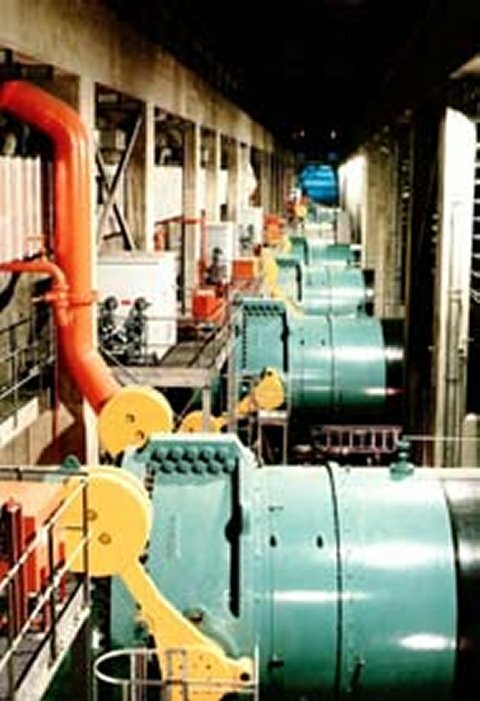 The pump storage system that produces electricity at Dinorwig relies on falling water to turn the turbines. The whole generating system buried deep in Eliden Mountain is in a cavern that is large enough to house St Paul’s Cathedral. While in action – as much water passes through the tunnels at Dinorwig as London uses in a whole day. There are tour guides who are very knowledgeable and will patiently answer all questions you throw at them. Once you have returned from a tour, you may enjoy a meal or snack at the Connections Café / Bistro. Or a browse around the shop may take your fancy. For sale are souvenirs and gifts. Closed December 23rd – January 4th. Free admission to Electric Mountain. Advance booking for the Tour is advisable. From the North A55 (coast road) Llanberis is clearly signposted and approximately 15 minutes drive via the A5, B4366 and the B454. From the South (Betsy-y-Coed, Capel Curig and Bethesda) use the A498 and then the A4086 to Llanberis. Now here’s something really crazy. Designer Rob Lovegrove has a concept of a “car on a stick” – a sort of cross between a car and a lamp-post. The little bubble-shaped vehicle, with its strange, flower-like interior design, carries up to four passengers and their shopping around the mall, taking voice commands and using satellite navigation. It’s solar powered, and completely electric, and when you’ve had enough of it, you just park it up. But there’s more – instead of taking up space and languishing unused at night, the little car somehow gets elevated on a telescopic pole, and lights up to become a street lamp. Quite how it achieves this, I’m not sure, and if the process is automated, exactly how it ensures all the passengers have got out is also a mystery. As a person who is prone to falling asleep at inconvenient moments, it conjures visions of waking up and finding myself trapped inside the street architecture, waiting for someone to want to go shopping so that I can get out. Don’t worry – it’s all just a concept, and I don’t think we’ll be seeing any in the near future. It’s interesting, though. It’s the design equivalent of a thought-experiment, and elements of the design might just be worth taking further. Besides, it’s a shiny pretty thing, which the world needs more of. For those of us a little wary of electricity, “ZAP” may not be the best name for an electric appliance of any kind. In this case, however, ZAP stands for Zero Air Pollution, and is the name of the automotive designers behind the “Alias” electric car, which might be available sometime in 2009. It’s striking to look at – I rather like it from the front. Most electric vehicles seem to be the design equivalent of government supplied medical prosthetics, so anything that looks remotely sporty has a market edge straight away. I did say I liked it from the front – it was more difficult to find a rear view in my searches, and I can see why it’s not the main publicity shot. It does look a bit as though you’ve driven off and left the rear wheel behind. Rear wheel – singular – brings me to something else interesting about the Alias’s design. It’s a three-wheeler, which has interesting issues in the UK, and maybe elsewhere. Another ZAP design, the Xebra-2 has already passed the VOSA tests, required before any vehicle is allowed to be driven on public roads, and is also a three-wheeler. This one has two rear and one front wheel, and looks a little like a modern rendering of the Reliant Robin, whereas the Alias has two front and one rear wheel, as did the now highly collectable Isetta. The Isetta did not become very popular in the UK until this three-wheeled version was introduced – previous models had four wheels, with two small wheels at the back close together. UK motorists took to the tricycle version because it could be driven on a motorcycle licence, and attracted a much lower rate of road tax, which is determined in part by the number of wheels. ZAP, based in California, have been designing and selling their electric vehicles since 1994, and have a good range of vehicles for different needs. What makes them different from other makes is partly this proven track record, and partly that the cars are rather well designed. Their range includes an the stylish Obvio, and an impressive collaboration with Lotus, to create the ZAP-X. Their website has all the technical details, and a pre-order form, but there’s an excellent synopsis of the company’s current and new ranges at Fuel-Efficient-Vehicles. The G-Wiz automatic, electric car has emissions at least 40% less than any hybrid car, and a range of up to 48 miles before recharging using a power lead and an ordinary domestic socket. You can also ‘green pimp it’ by adding rafia fibre seat covers and installing a solar panel sun roof that powers your sound system. Even at Christmas, often a season of excess, people are finding ways of going green. The Rockefeller Christmas tree is the biggest, and the greenest, ever this year. The 84-foot spruce is covered in over 30,000 energy-efficient LED lights, powered by what will become a permanent array of photovoltaic panels installed on the roof of the Rockefeller Center and continue to power the building once Christmas is over. However, an aquarium centre in Japan has come up with an energy efficient and wonderfully crazy idea. Their tree lights are powered by an electric eel. Whenever the eel at the Aqua Toto Gifu aquarium touches a copper wire in its tank, it generates a current that eel-luminates the light bulbs on the Christmas tree. Electric eels are not true eels. In fact, they are members of the catfish family. They grow to a couple of metres long, and have good hearing although they are more or less blind. Their electrical discharge, which they can moderate the strength of, is usually used for hunting prey and in self-defence and can range from tens to hundreds of Volts. As for powering Christmas trees, the eels obviously have potential. According to the Mainichi Daily News, officials expect the “eel Christmas tree” to be “a popular attraction for dating couples in the lead-up to Christmas Day, when the tree will be removed”. Funnily enough, this isn’t really my idea of a romantic evening, but perhaps they find it puts a spark into their relationship!! CRAZY WEDNESDAY: DO ANDROID DREAM OF ELECTRIC …GOATS? Now here’s an idea that is actually solving a little litter problem. The Japanese site Asahi via Pink Tentacle reports on the Edogawa Kyotei boat race course in Tokyo was having difficulty persuading gamblers to dispose of their losing tickets thoughtfully, until they installed this lovely 160cm tall electric Rocky Mountain goat. He’s a real cloven-hoofed cleaner-upper, with his friendly thick woolly coat and sensors inside his mouth, he’s now gorging on 500 tickets each day. Previously, these same tickets just ended up on the floor. Now I know it’s not exactly recycling, but the human motivation factor is interesting. People do things more when they are fun. Perhaps there are ideas for design of recycling bins that could use this psychology to better effect. The goat-keeper himself has a rather more spiritual explanation, though. “It eats up your frustrations so that you will have better luck with the next race”, he says.